Orla’s family emigrated from England to Australia in 2004. She is currently studying Justice at university and looks forward to making a difference in people’s lives. She applied to be a face of our ‘Believe in Beautiful’ campaign because she’s currently working on being healthier and better within herself and felt Brazilian Beauty’s values matched her own. Why were you drawn to the ‘Believe in Beautiful’ campaign? I thought the concept of using real people instead of models was so powerful. It’s amazing that Brazilian Beauty wanted to use its own clients. I knew it was something special and I wanted to be apart of it! There is no definition! I think the cool thing about beauty is that it’s everywhere and in everyone. It’s not something you can explain because it’s there no matter what. You just have to accept who you are and believe. Who is one person you admire for their beauty and why? I don’t think there’s any one person I admire! Everyone in my life is so different and they all have aspects I admire and try to emulate. If I really had to pick one person, it would be my mum. She’s so selfless and always aiming to better herself...how could you not admire that! 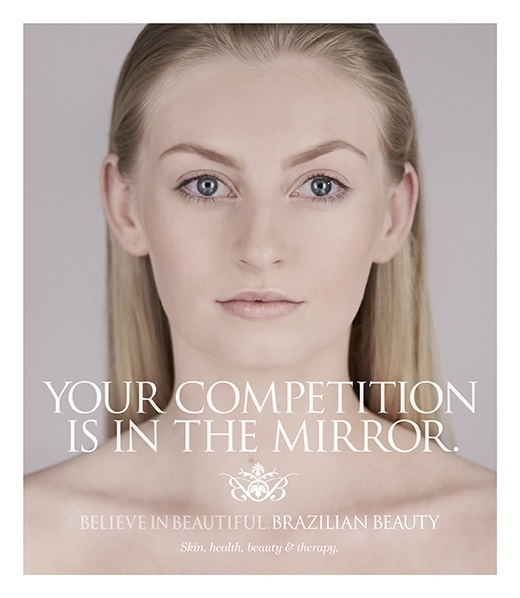 Describe how Brazilian Beauty helps you feel more beautiful. Brazilian Beauty gives me somewhere to relax and unwind. Taking the time to take care of myself and reflect makes me feel more beautiful. The lovely girls in the salon are always there to help! Being a uni student, how to you deal with stress? It’s an ongoing struggle for me, but I try to write lists and stay on top of my work as it comes in. I’m a self confessed perfectionist and I think the most important thing is to keep perspective and remember it’s not the end of the world if you don’t get the best grade. What are your 3 top beauty tips? 1. Drink water like it’s your job. 2. Always take your makeup off before bed. 3. Confidence does more than makeup ever will. The lash lift. It wakes my eyes up and I don’t have to wear makeup! Tell us the best piece of beauty advice you have been given? Work with what you’ve got and never change it. What is your favourite quote or motto that you live by daily?